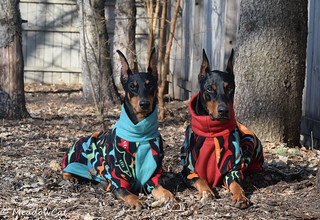 Doberman Forum : Doberman Breed Dog Forums > Doberman Training & Obedience > Obedience, Agility, and Working Sports > Nosework Meetup group? Have been thinking about starting one of these locally to share practice and locations with others. Classes are very expensive in our area and many times, the class is simply about the instructor setting up a blind search, not really much else. I think I’d like to limit it to people who are training at L3 or higher, just not wanting to get into having to instruct newcomers at every meetup. Thoughts? Ideas? Anyone already belong to a nosework practice or meetup group? I live in central Fl we have a NACSW group at the NW3 and Elite level that practice with an NACSW instructor who is at the Summit level with his dog once a month. This practice is usually 3 hours. I travel to Gainesville Fl (2 hours one way) to practice with a group also NW3 and Elite with two NACSW instructors, this group meets every Sunday for 2 hours. I think you are a few too many states away from me. And besides, we aren't at that level yet. There is someone over in the Houston area that offers classes, but a) I can't drive that far every week for a class and b) they use a different method than I do. I'll just stick to FDSA for now, especially since a lot of the Facebook student groups now have teaching assistants to help us Bronze students. I really am just looking for ideas about starting a group. I’m in an area with teachers and have taken a bunch of classes over the last 3 years. It’s just that it seems like we now do the same thing over and over + the teachers most often just use their same facility over and over. Just hoping to hear what some other groups are doing with co-training that wouldn’t cost a lot and we could learn from each other in a different format. Have done it numerous times randomly with a friend here and there but now thinking to get a bit more organized with it. Dobegal, is your group organized through meetup or a Facebook group? Do you share finding practice sites? Share placing hides? We know each other from different places. The Orlando group started out in classes and then the instructor started his private NW business. The Gainesville group know each other from the instructors classes and some one from Orlando practices with them and that is how I got invited. We do not share places as the practice sessions are in different parts of the state. The instructors find the places. Gainesville has many parks for exteriors. A few people there have their own businesses so we train sometimes interiors using their sites. A lot of exteriors in Gainesville. Orlando the instructor finds interiors. As example churches or businesses. Sometimes we have to pay extra for the use of these buildings. The cost is the same $20 unless we are renting somewhere in Orlando. There is always a focus objective: Converging odor, inaccessible, elevated, in ground etc. for either group. Only the instructors place the hides. Orlando practice sessions run about 3 hours Gainesville is a 2 hour practice session. Anywhere from 5-8 people both in Gainesville or Orlando. We divide into two groups in Gainesville because we have two instructors and get in about 6 searches. With the one instructor in Orlando we still get 6 searches thus the 3 hours. It's too bad your instructor isn't meeting your needs - that's disappointing. Our classes are challenging, even at higher levels. We do also have a huge nosework community here in Minnesota. There are a lot of meet ups for practice, as well as "sniff-n-gos", where instructors or skilled people will set up a half-day practice where it's a nominal fee to cover the space rental or whatever and someone sets hides - maybe 4 searches - and people have a set time that they come and search, get feedback. We also sometimes do mock trials around here. We have a couple of Facebook groups. One is for students of my instructor, one is a general group for people in the area, etc. People post on there often. We also do informal stuff with friends. It's really nice to live in an area that is a hotbed of Nosework, that's for sure. Really good instructors and a lot of people that have been involved for a lot of years, so we have a lot of opportunities.